My granddad always planted his garden peas between the middle and end of March. That means that right now is a perfect time. The first thing you need to do is decide which kind of pea you want to plant. Do you want to plant English or “shelling” peas? These are the traditional green pea—sweet and tender little peas that need to be shelled because the pods are tough and stringy. Maybe you want snow peas? Snow peas are picked when the pods haven’t filled out yet because when the tiny peas inside begin to fatten up, the pods get stringier. Or maybe you want snap peas—crispy crunchy sweet pods that can be eaten at any stage. Keep in mind that all peas are viners so support may be necessary. There are a few dwarf snap pea varieties (Cascadia, Sugar Ann etc.) that are only a couple of feet tall so will sort of “hold on” to each other and don’t need a trellis. Most other varieties will. I have used many things to trellis peas on—even a tomato cage! If I’m feeling particularly organized, I’ll put up a couple of poles and string twine back and forth between them. Choose a spot that gets at least six hours or more of direct sun. Loosen the soil. Soak the seeds for 12 to 24 hours in water. This isn’t necessary but can speed up germination by a few days. Plant the seeds 1” deep and 2” apart in rows at least 12 to 24” apart. You should consider using a pea/bean inoculant—a strain of Rhizobium bacteria that can increase your yields. We carry it here in little packets with our pea and bean seeds. The inoculant helps legumes (like peas and beans ) more efficiently utilize the nitrogen in the air around them. The biggest insect problem I’ve ever had with pea plants is aphids attacking the newest tender growth. I simply set my hose nozzle to mist and wash them off. Peas can sometimes have a problem with powdery mildew. The best way to address this is not to get the foliage wet when you water. Also, when planting peas, space your rows a minimum of 2 feet apart for the best air circulation. We can’t control what Mother Nature does. However, we can try not to compound the problem. By the way, to minimize the problem next year, be sure to keep weeds and debris out of your garden because the spores can over-winter on it. 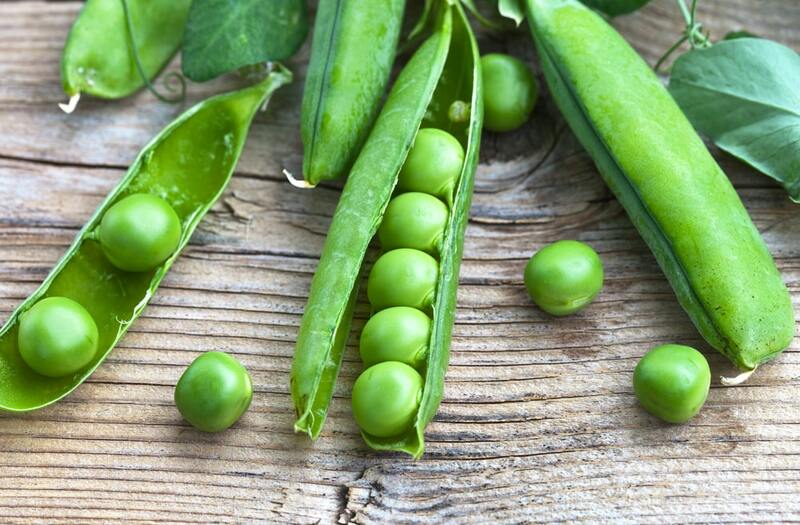 Peas are easy to grow and delicious to eat—did you know that the sugar in peas begins to convert to starch as soon as they’re picked so fresh is always better. What could be fresher than your own backyard?